Once your hard boiled eggs have cooled and dried, pour enough vinegar into a small bowl or mug so that you can dip the egg and completely cover them in vinegar. Dip one egg into the vinegar, then set it onto a spoon and lower it into a small ceramic bowl or short disposable cup. Don't let the vinegar dry (you'll have about 5 minutes before it dries, so don't worry about rushing). Use the spoon to carefully set the egg on a paper towel lined baking sheet to dry. 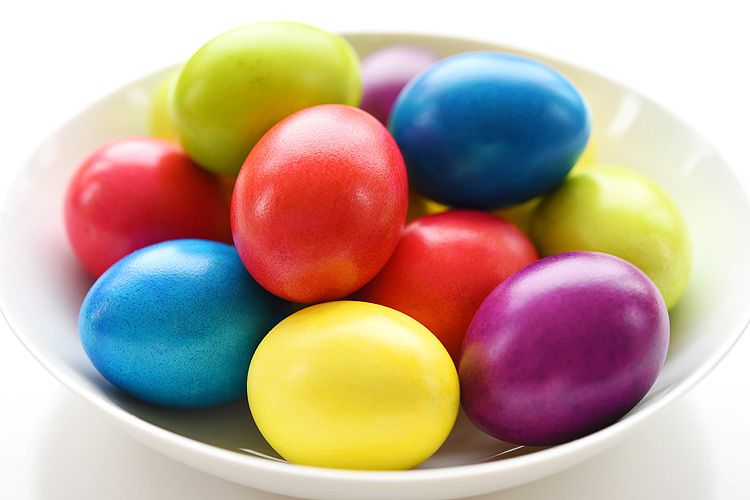 To make another egg of the same colour, dip another egg in the vinegar, then use the spoon to set the egg into the bowl and roll it around in the food colouring that was left at the bottom. Add more drops of food colouring as needed to make sure the egg is covered. (You'll only need 6 or 7 drops for the second and third eggs). Repeat the steps for each new colour, but make sure you use a clean bowl and spoon for each colour. Once the eggs have completely dried (about 45 minutes), pour a few drops of cooking oil onto a paper towel. Rub the oil all over the egg to give it a shiny finish. If the oil rubs off the eggs onto your fingers, use a clean paper towel to rub off the excess oil. If you make these eggs in advance, make sure you pull them out of the fridge and open the lid for at least 2 hours before you serve them. You want all the condensation to dry before you serve these to your guests or fingers will get VERY messy.